This spacious and bright condo (1090 including lanai) is on the second floor of a quiet building overlooking the 9th fairway of the Kona Country Club with the blue Pacific beyond. 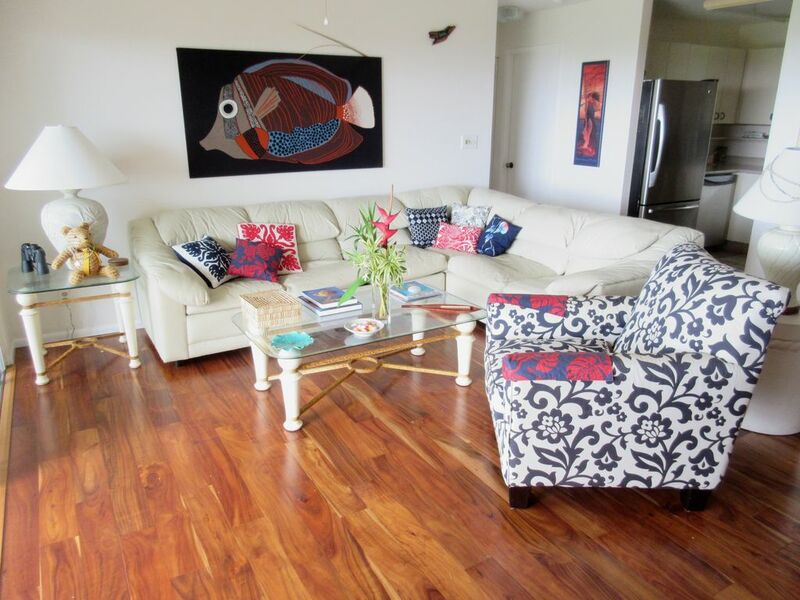 Tastefully remodeled with built-in oak cabinets throughout, rich Australian acacia flooring, elegant furniture, and original art on the walls. Fully equipped gourmet kitchen. Large comfortable lanai for outdoor living, with your own gas barbecue grill. Enjoy ocean views from floor-to-ceiling windows in every room -- even from the king-size bed and the double bathroom. Swimming pool shared among only 47 units: you will often have the pool all to yourself. Manicured and fragrant tropical gardens. Easy walk to Keauhou Bay, Sheraton resort, and golf clubhouse. Less than a mile to major shopping center and just a little further to the best snorkeling beach in Kona (Kahalu'u). Things To Do: Be sure to pick up the free brochures available just about everywhere (airport, shopping areas, hotel lobbies) that describe the many activities you may choose and include valuable discount coupons. They also have extensive listings of restaurants and area maps. Sample titles: Hawaii Gold; This Week Big Island; 101 Things to Do. Another good source of information is the local daily newspaper, West Hawaii Today, available at many locations, including KTA supermarket and Longs drugstore. The Keauhou Shopping Center offers activities in the central court almost every day (music, hula, crafts): check the posted schedule. Keauhou Canoe Club: See the Island the way the ancient Hawaiians first did: from a double-hulled canoe. The Canoe Club, headquartered on nearby Keauhou Bay (5 min. walk from the condo), promotes the ancient Hawaiian art of paddling. Visitors are welcome on Tuesdays, Thursdays and Saturdays. Two sessions, at 6:30 am and 8:00 am. Show up at the club at least 30 minutes early and members will loan you a paddle, teach you the basics, and take you on a one-hour energetic and magical trip. See the sun rise over Mauna Loa during the early session. Whale viewing in the winter months, spinner dolphins and manta rays all year round. Aloha Theater in Kainaliu: The Aloha is an old-fashioned theater located in the picturesque village of Kainaliu, just a few miles south of Keauhou on Highway 11. It is home to the Aloha Performing Art Company and regularly presents live shows and musical performances. If a show is on during your stay, don't miss this chance to see good community theater and meet the local residents. A nice cafe is next door, for pre-theater dinner or drinks. Started going to Hawaii over 30 years ago, first for work, then for pleasure. After a full career in Washington DC in the non-profit think tank sector, retired to eastern Washington state. We are snowbirds in Kona and also spend time in Lyon, France. We knew we wanted to be on the Big Island, and when we first walked through the front door of this condo with our realtor, it was love at first sight. It has everything we wanted: ocean views, bright large rooms, manicured gardens, a friendly community of neighbors who care about each other. Always quiet, and yet close to services, shopping, restaurants, Kailua village. A unique historical area, with the King's birthplace and the ancient fishing village on the Sheraton grounds. The beautiful Keauhou Bay and access to all water sports. The true 'aloha' of the community of paddlers at the Keauhou Canoe Club. The incredible sunsets. The fragrant trees at night. Double vanity; mirrored wall> Large soaking tub. Separate Italian-style walk-in shower with large window over mimosa trees and tropical garden feels like an outdoor shower. An additional window provides excellent light and cross ventilation. Included are both bath and beach towels. Also included is a coffee grinder to enjoy super fresh Kona coffee beans. Gourmet set of pots, pans, frying pans, and appropriate utensils. Complete set of Martha Stewart dishes for 8 plus numerous serving bowls and platters. Full complement of glasses for both the table and the bar. Large round table and four dining chairs. Elegant built-in cabinets hold glassware, serving pieces, flower vases, and a variety of table mats and cloths. Many books on Hawaiian history and culture, as well as guidebooks to the Big Island. Boogies boards, beach mats, beach umbrella, beach chairs. Condo is adjacent to the Kona Country Club. Comfortable Tropitone outdoor furniture on lanai: dining table, 4 swivel dining armchairs, 2 lounges with footrests. Gas BBQ also on private lanai. The location and amenities of this condo exceeded our expectations. Parking in a convenient and shady space directly in front of the lushly landscaped grounds and an easy walk takes you to the second floor condo overlooking a quiet, well-tended golf course and expansive ocean views. The kitchen is well-equipped with all you need for cooking meals. Beautiful Hawaiian artwork adorns the walls, a full entertainment center with high-end t.v. and stereo is available for use. The spacious living room has a full wall of glass sliders leading out to a wonderful lanai, where we spent many an evening enjoying the sunset as well as breakfast with the friendly geckos. The bed was very comfortable, and ample ventilation and excellent ceiling fans ensured a good night's sleep. The bathroom was spacious, newly remodeled with a soaking tub and unique shower area. We really appreciated having use of a washer and dryer right in the condo. This condo complex is quiet and the location in Keauhou is convenient for shopping and very close to our favorite snorkeling spot. It was also a good base for day trips to other parts of the island. We couldn't have been more happy with our stay there. Elaine was very pleasant and easy to deal with, and responded quickly to questions that we had. The condo was very comfortable for my husband and I. One of our favorite things was sitting out on the lanai with the geckos, looking out over the golf course and the ocean beyond, listening to the variety of birds singing. It was so peaceful and beautiful. The owner, Elaine, is very responsive and easy to work with, and so is the on-site property manager. Overall, we were satisfied with this property. Everyone we met staying in this area were great, the pool was great for laying out. The property is close to a supermarket, drugstore and a couple of restaurants. Safe to run or bike outside of the condo. The condo, overall, was great. Spacious and all of the baking pans/cookware we could need for a week. However, when we walked in, it was not super clean. 30 minutes of cleaning took care of the situation, so not a big deal, but it did feel like we were walking in on someone else staying there. This was our first experience with VRBO and we would stay hear again and try VRBO at a different location again. Thank you Jami for your review. I am glad you enjoyed our beautiful neighborhood. I apologize for the less than perfect cleaning. Immediately after Christmas, my housekeeper was somewhat rushed and apparently skimped on her usual excellent job. She is now back in full operation mode and looks forward to making the condo sparkle for the upcoming guests. Wonderfully appointed condominium in a prime location! The unit is in a marvelous location, with nice sunset views overlooking the Kona Country Club golf course and the ocean. It is wonderfully appointed and really brings a sense of calm and relaxation after a busy day. I will try and rent again on my next trip! We had the pleasure of staying in this lovely condo. It is a beautifully furnished and well kept property. We slept like a dream in the comfy bed and enjoyed the lanai every day and evening as well. Having a BBQ right there was a real treat! The condo is equiped with everything we needed.The location is close to many beaches and golf courses. We hope to return one day soon! Great Condo and location. We started our 2 week trip to the Big Island here and it was a perfect jump off point for the rest of our vacation. Relaxing location with an incredible sunset view off the lanai. Clean and spacious residence, with a super comfortable bed and great tub and the washer and dryer were nice to have. The location south of Kona was great central location for us. We went south to the Place of Refuge and 2 Step Beach for snorkeling with spinner dolphins and turtles (about 45 minute drive). We went north to the harbor to go whale watching with mother and calf humpbacks breaching just off our bow (about 30 minute drive). Taxi ride up to Huggo's ran about $25 and took about 15 minutes. Very relaxing location. Keauhou is a beautiful residential and resort area just 6 miles south of the picturesque town of Kailua-Kona, with its great shopping and dozens of restaurants. Bordered by the blue Pacific on one side, and the verdant slopes of Mauna Loa on the other, Keauhou is close to all ocean sports and pleasures. Just a few miles upcountry is the world-famous Kona coffee growing area and picturesque 'old Hawai'i' villages such as Holualoa and Kainaliu. Volcanoes National Park, Hilo, the rainforest of the Hamakua Coast, Mauna Kea, Waimea/Kamuela and the ranch country are all easy one-day excursions.. Golf: The Kona Country Club is open to the public. It offers 36 holes, in the Ocean and the Mountain Courses. Green fees vary from $165 (prime time on Ocean course) to $60 (9 holes in the afternoon). The clubhouse is a 5-minute walk from the condo.